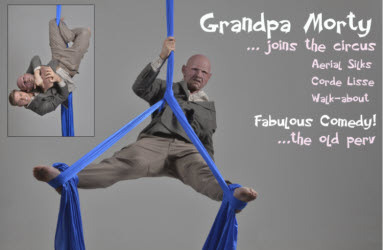 Joseph takes his love of quirky comedy and couples it with his astounding aerial acrobatic skill (with a full prosthetic head of makeup) to give audiences a bit of what they all desire... A huge slice of Grandpa Morty. 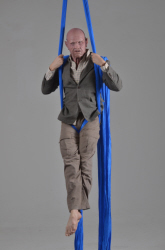 Grandpa Morty comes in a varity of forms on Aerial Silks or Corde Lisse (Rope). -Grandpa Morty does whatever you want! Have an idea... An act can be created for ANY occasion. This is the most creative, innovative comedy act I have seen in a long time. 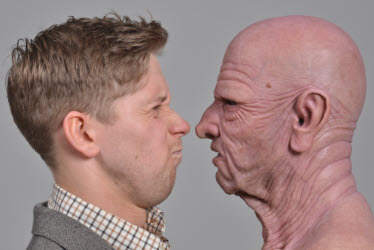 I genuinely thought that this was an old man. 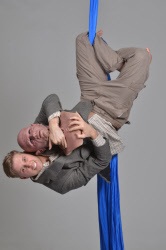 Absolutely brilliant prosthetic makeupand comedy movement... And such an impressive aerialist... For a (not so) old guy ;). For that really special occasion why not employ the very latest in bartenders.....classy girls who serve your guests their drinks while suspended from trapeze or aerial hoops. 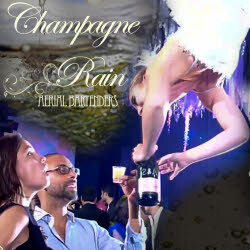 Yes, the Champagne Rain bartenders are available to make your night special. 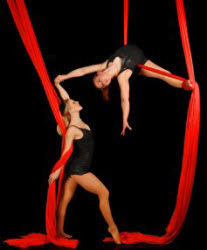 Tink and friends provide a wonderful spectacle of aerial skills such as silks and hoops. They also offer stiltwalking with amazing costumes as well as Human Statues. A very versatile group of performers. minimum breaking strain of 1000kg. 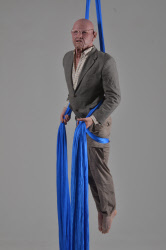 Minimum height requirement for silks and net is 5 metres. Minimum height requirement for hoop and pyramid is 4 metres. For Groundbased Acts / Skills a clear safe working area is required. If the performer you are interested in isn't listed, don't worry. Please contact us and we will endeavour to fulfil your requirements. Alternatively have a look at our sister site: www.aurorascarnival.co.uk or contact us if you have any questions, or require a quote for entertainers for your event.